(1) Applicability. Except as otherwise provided, this rule applies to actions in personam with process of maritime attachment and garnishment, actions in rem, and petitory, possessory, and partition actions, supplementing Rules B, C, and D.
(a) Complaint. In actions to which this rule is applicable the complaint shall state the circumstances from which the claim arises with such particularity that the defendant or claimant will be able, without moving for a more definite statement, to commence an investigation of the facts and to frame a responsive pleading. (b) Security for Costs. Subject to the provisions of Rule 54(d) and of relevant statutes, the court may, on the filing of the complaint or on the appearance of any defendant, claimant, or any other party, or at any later time, require the plaintiff, defendant, claimant, or other party to give security, or additional security, in such sum as the court shall direct to pay all costs and expenses that shall be awarded against the party by any interlocutory order or by the final judgment, or on appeal by any appellate court. (a) In admiralty and maritime proceedings process in rem or of maritime attachment and garnishment may be served only within the district. (b) Issuance and Delivery. Issuance and delivery of process in rem, or of maritime attachment and garnishment, shall be held in abeyance if the plaintiff so requests. (4) Execution of Process; Marshal’s Return; Custody of Property; Procedures for Release. (a) In General. Upon issuance and delivery of the process, or, in the case of summons with process of attachment and garnishment, when it appears that the defendant cannot be found within the district, the marshal or other person or organization having a warrant shall forthwith execute the process in accordance with this subdivision (4), making due and prompt return. (b) Tangible Property. If tangible property is to be attached or arrested, the marshal or other person or organization having the warrant shall take it into the marshal’s possession for safe custody. If the character or situation of the property is such that the taking of actual possession is impracticable, the marshal or other person executing the process shall affix a copy thereof to the property in a conspicuous place and leave a copy of the complaint and process with the person having possession or the person’s agent. In furtherance of the marshal’s custody of any vessel the marshal is authorized to make a written request to the collector of customs not to grant clearance to such vessel until notified by the marshal or deputy marshal or by the clerk that the vessel has been released in accordance with these rules. (c) Intangible Property. If intangible property is to be attached or arrested the marshal or other person or organization having the warrant shall execute the process by leaving with the garnishee or other obligor a copy of the complaint and process requiring the garnishee or other obligor to answer as provided in Rules B(3)(a) and C(6); or the marshal may accept for payment into the registry of the court the amount owed to the extent of the amount claimed by the plaintiff with interest and costs, in which event the garnishee or other obligor shall not be required to answer unless alias process shall be served. (d) Directions With Respect to Property in Custody. The marshal or other person or organization having the warrant may at any time apply to the court for directions with respect to property that has been attached or arrested, and shall give notice of such application to any or all of the parties as the court may direct. (e) Expenses of Seizing and Keeping Property; Deposit. These rules do not alter the provisions of Title 28, U.S.C., §1921, as amended, relative to the expenses of seizing and keeping property attached or arrested and to the requirement of deposits to cover such expenses. (f) Procedure for Release From Arrest or Attachment. Whenever property is arrested or attached, any person claiming an interest in it shall be entitled to a prompt hearing at which the plaintiff shall be required to show why the arrest or attachment should not be vacated or other relief granted consistent with these rules. This subdivision shall have no application to suits for seamen’s wages when process is issued upon a certification of sufficient cause filed pursuant to Title 46, U.S.C. §§603 and 604 1 or to actions by the United States for forfeitures for violation of any statute of the United States. (a) Special Bond. Whenever process of maritime attachment and garnishment or process in rem is issued the execution of such process shall be stayed, or the property released, on the giving of security, to be approved by the court or clerk, or by stipulation of the parties, conditioned to answer the judgment of the court or of any appellate court. The parties may stipulate the amount and nature of such security. In the event of the inability or refusal of the parties so to stipulate the court shall fix the principal sum of the bond or stipulation at an amount sufficient to cover the amount of the plaintiff’s claim fairly stated with accrued interest and costs; but the principal sum shall in no event exceed (i) twice the amount of the plaintiff’s claim or (ii) the value of the property on due appraisement, whichever is smaller. The bond or stipulation shall be conditioned for the payment of the principal sum and interest thereon at 6 per cent per annum. (b) General Bond. The owner of any vessel may file a general bond or stipulation, with sufficient surety, to be approved by the court, conditioned to answer the judgment of such court in all or any actions that may be brought thereafter in such court in which the vessel is attached or arrested. Thereupon the execution of all such process against such vessel shall be stayed so long as the amount secured by such bond or stipulation is at least double the aggregate amount claimed by plaintiffs in all actions begun and pending in which such vessel has been attached or arrested. Judgments and remedies may be had on such bond or stipulation as if a special bond or stipulation had been filed in each of such actions. The district court may make necessary orders to carry this rule into effect, particularly as to the giving of proper notice of any action against or attachment of a vessel for which a general bond has been filed. Such bond or stipulation shall be indorsed by the clerk with a minute of the actions wherein process is so stayed. Further security may be required by the court at any time. If a special bond or stipulation is given in a particular case, the liability on the general bond or stipulation shall cease as to that case. (c) Release by Consent or Stipulation; Order of Court or Clerk; Costs. Any vessel, cargo, or other property in the custody of the marshal or other person or organization having the warrant may be released forthwith upon the marshal’s acceptance and approval of a stipulation, bond, or other security, signed by the party on whose behalf the property is detained or the party’s attorney and expressly authorizing such release, if all costs and charges of the court and its officers shall have first been paid. Otherwise no property in the custody of the marshal, other person or organization having the warrant, or other officer of the court shall be released without an order of the court; but such order may be entered as of course by the clerk, upon the giving of approved security as provided by law and these rules, or upon the dismissal or discontinuance of the action; but the marshal or other person or organization having the warrant shall not deliver any property so released until the costs and charges of the officers of the court shall first have been paid. (d) Possessory, Petitory, and Partition Actions. The foregoing provisions of this subdivision (5) do not apply to petitory, possessory, and partition actions. In such cases the property arrested shall be released only by order of the court, on such terms and conditions and on the giving of such security as the court may require. (6) Reduction or Impairment of Security. Whenever security is taken the court may, on motion and hearing, for good cause shown, reduce the amount of security given; and if the surety shall be or become insufficient, new or additional sureties may be required on motion and hearing. (a) When a person who has given security for damages in the original action asserts a counterclaim that arises from the transaction or occurrence that is the subject of the original action, a plaintiff for whose benefit the security has been given must give security for damages demanded in the counterclaim unless the court, for cause shown, directs otherwise. Proceedings on the original claim must be stayed until this security is given, unless the court directs otherwise. (b) The plaintiff is required to give security under Rule E(7)(a) when the United States or its corporate instrumentality counterclaims and would have been required to give security to respond in damages if a private party but is relieved by law from giving security. (8) Restricted Appearance. An appearance to defend against an admiralty and maritime claim with respect to which there has issued process in rem, or process of attachment and garnishment, may be expressly restricted to the defense of such claim, and in that event is not an appearance for the purposes of any other claim with respect to which such process is not available or has not been served. (9) Disposition of Property; Sales. (C) there is an unreasonable delay in securing release of the property. 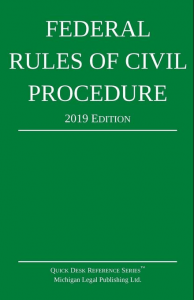 (ii) In the circumstances described in Rule E(9)(a)(i), the court, on motion by a defendant or a person filing a statement of interest or right under Rule C(6), may order that the property, rather than being sold, be delivered to the movant upon giving security under these rules. (b) Sales, Proceeds. All sales of property shall be made by the marshal or a deputy marshal, or by other person or organization having the warrant, or by any other person assigned by the court where the marshal or other person or organization having the warrant is a party in interest; and the proceeds of sale shall be forthwith paid into the registry of the court to be disposed of according to law. (10) Preservation of Property. When the owner or another person remains in possession of property attached or arrested under the provisions of Rule E(4)(b) that permit execution of process without taking actual possession, the court, on a party’s motion or on its own, may enter any order necessary to preserve the property and to prevent its removal.